Open Science is believed to be one of the means to accelerate new knowledge generation and products development, leveraging science communication with the Industry to strengthen regional economies. Elements of openness in research outputs, procedures and practices have been formally included in European Union strategies and priorities for Research, Development and Innovation such as the Innovation Union, the European Research Area and the Digital Single Market with the most recent achievement being the HorizonEurope mandates. The Research Center "Athena", in the framework of the European projects OpenAIRE, infrastructure for Open Science in Europe, and the RDA Europe 4, the European plug-in of Research Data Alliance (RDA), is organizing a two-day symposium entitled: "Open Science in the Greek research ecosystem: research processes, research data and partnerships". 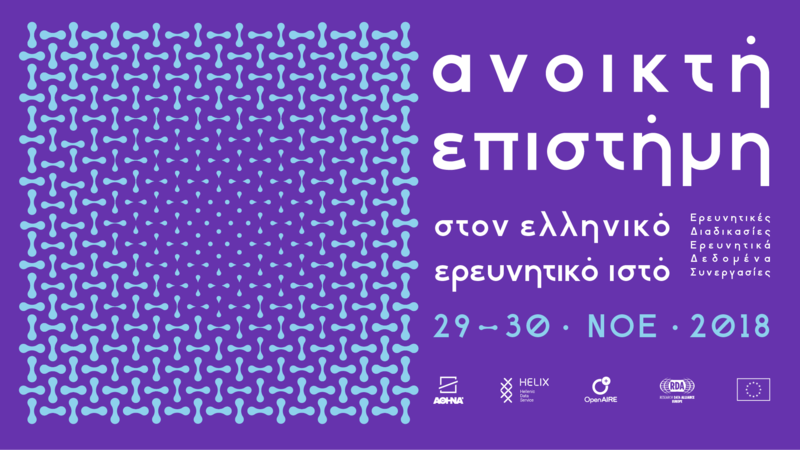 Symposium To be held from 29 to 30 November in Athens (Athinais). The Symposium will be attended by representatives of research and higher-education institutions of the country to inform the audience about their contributions, services and their work, and to be informed of the efforts at European and national levels as well as the latest developments in infrastructure, services, policies and legal issues around Open Science. First day revolves around topics for open science policies and infrastructures and welcomes Infrastructure and service managers, Project leaders/coordinators, Rectors, Head Librarians, Head of Research Centers as well as the General Secretariat for Research and Technology (GSRT) and the Greek Ministry of Education, Research and Religious Affairs. The second day is devoted to hands-on sessions, in an attempt to spread awareness and familiarise Repository, service and infrastructure managers, Librarians, Project administrators, Domain specific communities and individual researchers, early career researchers and students with Open Science practices and services. To learn and familiarize with new tools and technologies for research, created both within the HELIX national infrastructure, RDA and OpenAIRE and through the other projects and synergies. These may include interoperability and repositories infrastructure services, tools to create and apply Data Management Plans, enrollment of e-infrastructure service tools to the European service catalogue, etc.